The Mondo+ (plus) from Grace digital provides superior sound in a stylish design that incorporates your favorite listening options into a single device! you can stream your favorite apps including Amazon music, Pandora, Google play, tune in, radio, Spotify, YouTube music and many others! Group multiple Mondo+ units together with Wi-Fi connectivity and control the stream content throughout your home. Max audio technology from waves Inc. Gives the Mondo+ room filling sound from the custom 3 woofer and 1 tweeter speaker drivers. Charge your phone through the USB 5V port in the back or plug in a compatible USB storage device with saved music files and play the music directly through the Mondo+. Bluetooth V4.1 integrated chip allows you to also connect and play music from your smartphone. 3.5 color display shows playlist; station and album art while streaming music and makes for easy navigation through menus; settings; and apps. Make your device portable with the optional rechargeable battery (sold separately). all product names and trademarks are the property of their respective owners (Bose, SONOS, demon, sound touch 10, play 1, HEOS Etc. ), which are in no way associated or affiliated with Grace digital or the Mondo+. product names are used solely for the purpose of identifying the specific products that were compared in the analysis. Use of these names does not imply any co-operation or endorsement. Via your smartphone or Chromecast Browser cast Pandora, TuneIn, Google play, Spotify, YouTube music, BBC, NPR and hundreds of others to your Mondo+! Control a Mondo+ with a Google Home (sold separately). Group multiple Mondo+ for multi-room audio synchronized playback. The Mondo+ (plus) from Grace Digital provides superior sound in a stylish design that incorporates your favorite listening options into a single device! you can stream your favorite apps including Amazon music, Pandora, Google play, tune in, , Spotify, YouTube music and many others! Group multiple Mondo+ units together with Wi-Fi connectivity and control the stream content throughout your home. Max audio technology from waves Inc. Gives the Mondo+ room filling sound from the custom 3 woofer and 1 tweeter speaker drivers. Charge your phone through the USB 5V port in the back or plug in a compatible USB storage device with saved music files and play the music directly through the Mondo+. Bluetooth V4.1 integrated chip allows you to also connect and play music from your smartphone. 3.5 color display shows playlist; station and album art while streaming music and makes for easy navigation through menus; settings; and apps. Make your device portable with the optional rechargeable battery (sold separately). all product names and trademarks are the property of their respective owners (Bose, SONOS, demon, sound touch 10, play 1, HEOS Etc. ), which are in no way associated or affiliated with Grace Digital or the Mondo+. product names are used solely for the purpose of identifying the specific products that were compared in the analysis. Use of these names does not imply any co-operation or endorsement. Enjoy an entertaining music listening experience with the Sungale KWS433 Wi-Fi Internet Radio. Listen to streaming music content coming from two high output speakers through online sources including iHeartRadio, Pandora, Tune In, Spotify and many more. Simply establish a Wi-Fi connection and find your source of choice and start streaming music from more than 18,000 internet radio stations. Utilize the LCD touch screen to navigate through the user-friendly interface. You can also transfer your own favorite music files onto the internet radio's 8GB of flash storage. 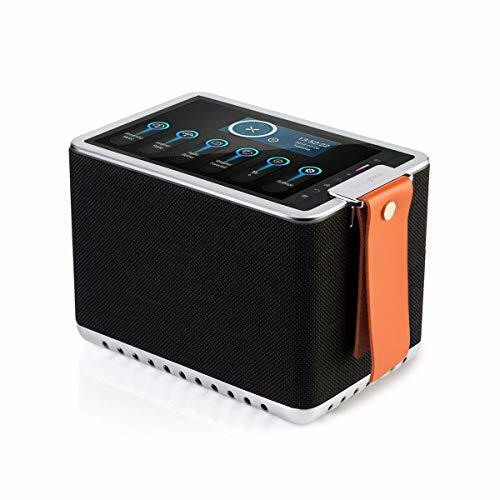 A super slim and lightweight design, along with a built in lithium ion battery allow portability and several hours of an unconnected music enjoyment without needing to be recharged. Ditch the bulky outdated home stereo systems and move on to the Sungale KWS433 Wi-Fi Internet Radio. 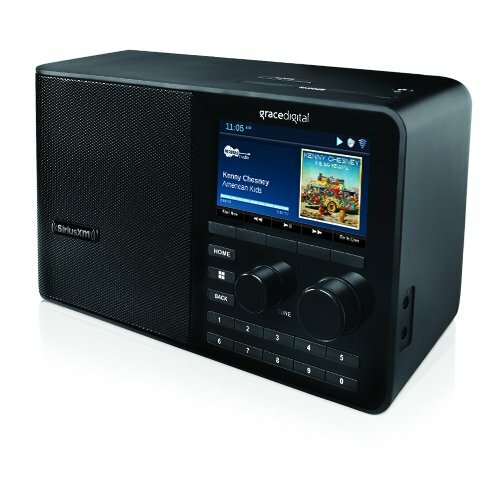 LISTEN TO STREAMING MUSIC OR ACCESS THOUSANDS OF RADIO STATION - Whether through Pandora, Tune-In, iHeartRadio, Spotify, or any of the many other additional streaming music or internet radio apps available, you can listen to all genres of music, talk radio, sports, and much more with a Wi-Fi connection. Over 18,000 radio stations are available for your choosing. ADD AND LISTEN TO YOUR OWN MUSIC - Have your own music files? Transfer them onto the Internet Radio's 8GB of storage and always have your favorite tunes readily available for your enjoyment. USER FRIENDLY TOUCHSCREEN - Use your finger to guide yourself through the user friendly interface on the 4.3 inch touchscreen to find and select your preferred app or favorite song to enjoy. EXCELLENT QUALITY SOUND - 2 small but remarkably powerful speakers and a subwoofer produce a strong yet clear sound that's comparable to larger audio systems. DESIGNED FOR PORTABILITY - A slim elegant light-weight design and a rechargeable internal battery allows you to enjoy hours of music from any room in your home without having to be constantly plugged in. Brand: Sungale | Manufacturer: Sungale Group Inc. 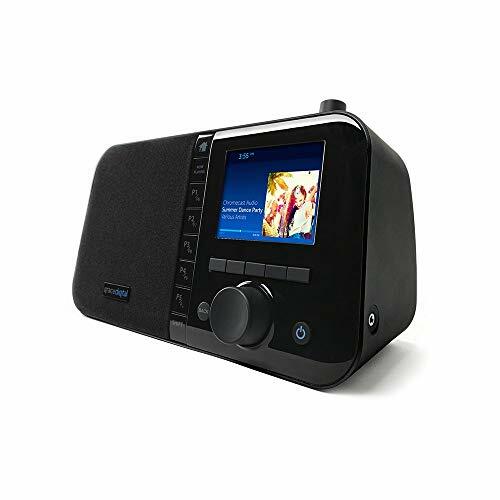 Enjoy an entertaining music listening experience with this Wi-Fi Internet Radio. Listen to streaming music content coming from two high output speakers through online sources including iHeartRadio, Pandora, Tune In, Spotify and many more. Simply establish a Wi-Fi connection and find your source of choice and start streaming music from more than 18,000 internet radio stations. Utilize the LCD touch screen to navigate through the user-friendly interface. You can also transfer your own favorite music files onto the internet radio's 8GB of flash storage. A super slim and lightweight design, along with a built in lithium ion battery allow portability and several hours of an unconnected music enjoyment without needing to be recharged. 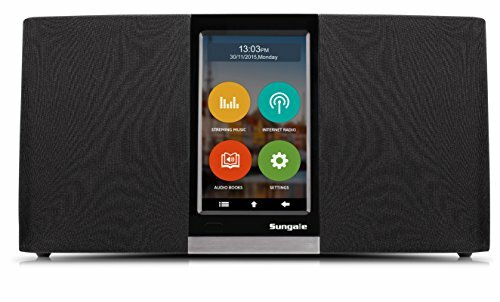 Ditch the bulky outdated home stereo systems and move on to this Sungale Wi-Fi Internet Radio. The Encore+ (plus) from Grace digital provides superior sound in a stylish design that incorporates your favorite listening options into a single device! Multiple ways to play your music. Directly from the radio you can select from thousands of AM/FM/HD radio stations that are streamed over the internet, including iHeartRadio, NPR, BBC, CBS radio, FOX news, podcast as well as SiriusXM (A SiriusXM subscription is required to play SiriusXM. Please contact SiriusXM directly to purchase a subscription). Looking to play Pandora, Spotify, TuneIn, YouTube you can cast them directly from a Browser or smartphone. Casting doesn't use your smartphone's battery and works from anywhere in your home's Wi-Fi coverage area. Group multiple radios together via the free smartphone app and play the same music or different music on each radio. Max audio technology from Waves Inc. gives the Encore+ room filling sound from the custom dual 3 main stereo drivers and 4 bottom facing woofer. Charge your phone through the USB 5V port in the back or plug in a compatible USB storage device with saved music files and play the music directly through the Encore+. Bluetooth V4.1 integrated chip allows you to also connect and play music from your smartphone. 3.5 color display shows playlist; station and album art while streaming music and makes for easy navigation through menus, settings, and apps. 100, 000 internet radio stations - iHeartRadio, cbs, npr, and SiriusXM (contact SiriusXM for a subscription). control the music from the radio, remote control, iPhone or Android remote control app. Via your smartphone or Browser send Pandora, tune in, Google play, Spotify, YouTube music, and hundreds of others to your encore+ ! group multiple encore+ for multi-room Audio synchronized playback. 17 different languages available: English, Deutsch,Spanish,Portuguese, Russian German, French, Norwegian, Italiano, Svenska, Dansk,Magyar,Cesky,Slovensky,Polski,Turkey,Suomi . Wi-Fi internet radio, 26,000+ radio stations. 250 presets. Bluetooth receiver- streaming music from other devices such as smart phone or tablet. 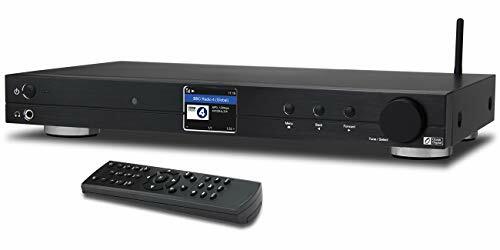 This tuner / receiver has NO BUILT-IN SPEAKER, 3.5mm audio out to connect external powered / active speaker. Stream music via UPnP from PC or via DLNA from smart phone, tablet to the radio. Features: Color LCD display,dual alarm clock and time keeper,weather and time dispaly,media U server. 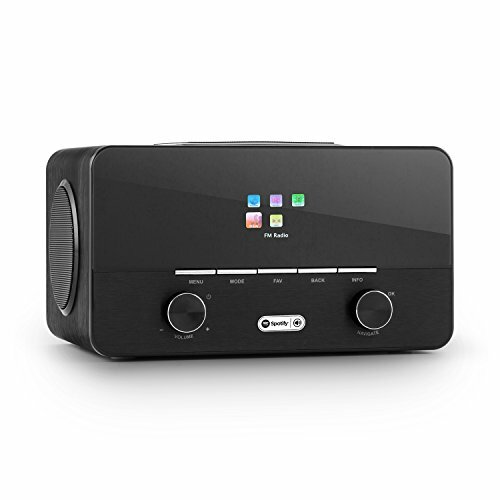 Stay entertained with Aluratek's AIRMM03F Wi-Fi Internet Radio, which makes it easy to access a variety of streaming content, including iHeartRadio, Pandora, Spotify and more. Get access to a world of instant entertainment with this product. 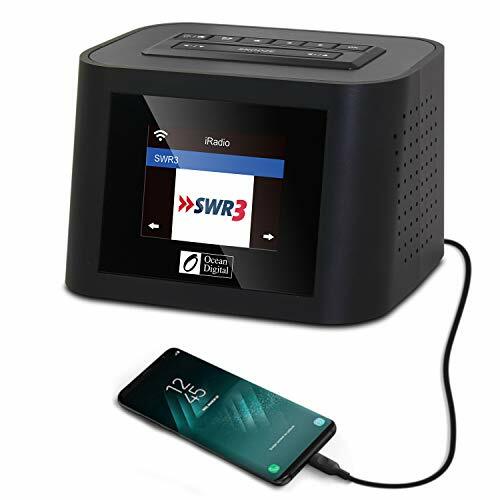 Just connect to the Internet to stream internet radio music, totaling more than 50,000 Internet radio stations and 35,000 podcasts. You can also access your favorite social media accounts such as Facebook, Twitter, Instagram and more. The easy to navigate touch screen LCD is very intuitive and easy to use. You can set the built-in full functioning alarm clock at the sound of your voice with the voice activation control feature. The AIRMM03F Wi-Fi Internet Radio includes a built in lithium Ion battery good for up to 6 hrs. of streaming before needing recharged. You can also transfer your favorite MP3 songs from your computer to the included 4GB built in memory. 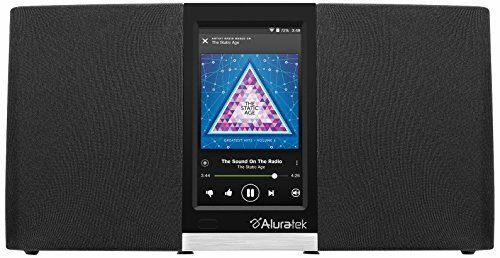 Free yourself from having to dock your smart phone to listen to music and enjoy all the new Wi-Fi Internet Radio from Aluratek has to offer. Convenient multi-tasking tool with clock, calendar, weather, alarm and memo apps. Easy to install social media apps such as Facebook, Twitter and Instagram. The Ocean Digital WR-26 has a decent long-lasting battery life makes it a truly Portable radio, All-in-One including Internet WiFi radio, FM and Bluetooth. The speedy power-to-play gets you internet music in no time! Even in such a compact size, the sound is still great and solid. You won't get bored with the WR-26 around! 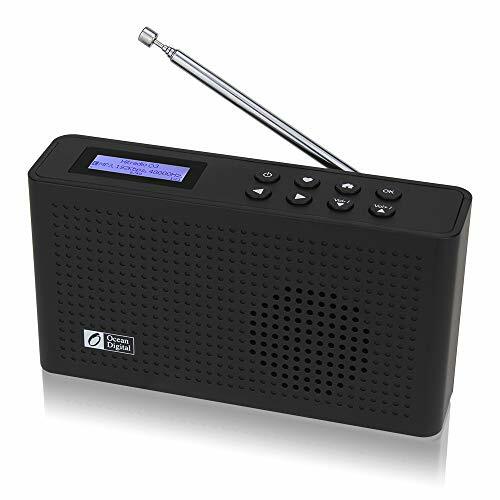 PORTABLE INTERNET WIFI RADIO/ BUILT-IN RECHARGEABLE BATTERY: Extra long-lasting play time on Wi-Fi for over 8 hours making it perfect for kitchen, garden or carry around in the house. Speedy power-to-play! INTERNET/FM - Variety of listening choices over 20,000+ internet stations for free, comes with ordinary FM reception. On the go! 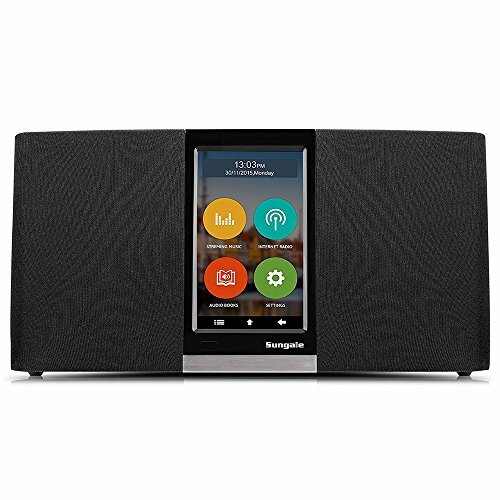 BLUETOOTH AUDIO STREAMING - Play your favourite music from your smartphone, tablet or other smart devices through the Bluetooth connectivity(not for wireless headphone/speaker). MAKE YOUR FAVOURITE LIST - Add your favourite channels up to 99 on the list. MORE COOL FEATURES - Headphone jack, Sleep timer setting, UPnP/DLNA compatible streaming. The Grace Digital Mondo+ Classic is the perfect combination of old world quality meets new world technology. 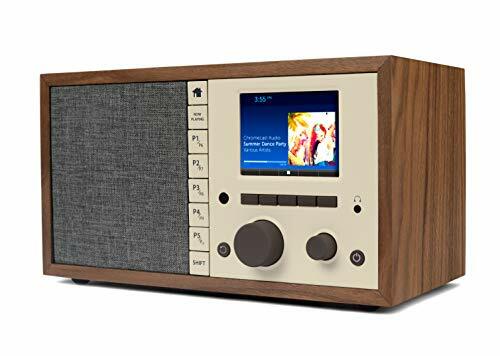 The Mondo+ Classic includes built in audio apps for access to over 100,000 internet radio stations, as well as Bluetooth. Control the Mondo+ Classic via the front panel controls, included infrared remote and the Grace Digital smartphone app remote controller. The Mondo+ Classic is the perfect bedside alarm clock with its 5 custom alarm settings, snooze and sleep timers, as well as custom day time and nighttime back-lit display settings. With an integrated class D 25 watt digital amplifier and 4 inch glass-fiber magnetic shielded custom full range speaker you will appreciate the warm deep bass and crisp highs coming from such a small package. Customize the sound by selecting one of our 5 preset equalizer settings or modify the bass and treble to your personal taste. Supported streaming protocols: HTTP, RTSP, WSMP, Shoutcast, Supported audio formats: AIFF, AIFC, WAVE, CAF, NeXT, ADTS, MP3, AAC/ACC+, Ogg Vorbis, FLAC, WMA. Supported playlist formats: ASX, M3U, PLS. Built in dual 2.4/5Ghz external antennas. Place a Mondo+ Classic in your bedroom, den and kitchen and play different music in every room, or synchronize your music throughout your home. With our built in multi-room audio feature you can mix and match any Mondo+, Mondo+ Classic and Encore+ and play different music or the same music synchronized through your house. Even charge your smart phone via the USB jack on the back of the radio or the 10 watt Qi charging pad on top of the radio. Utilize the stereo headset jack for personal listening, connect an external audio device to the line in jacks, or connect the Mondo+ Classic to your home stereo via the line output jacks. The options are endless. 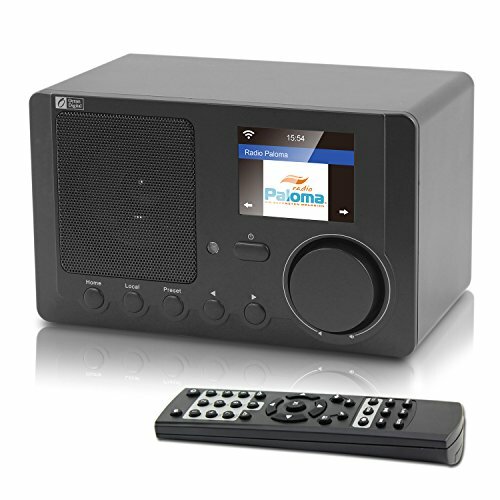 Internet radio with Wi-Fi interface, FM RDS receiver, MP3-USB port and AUX input. 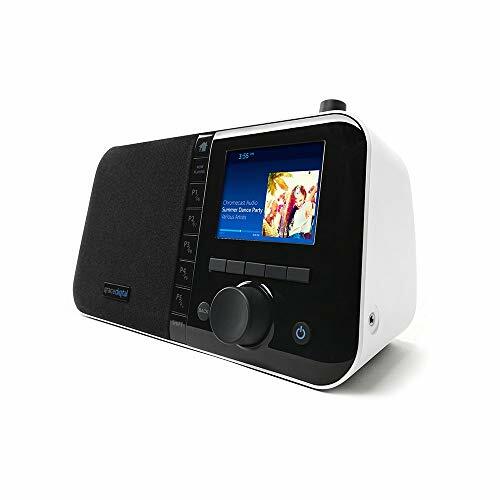 HiFi: This internet radio provides professional sound, delivered by two 2.5" broadband speakers and further supported by an 3" woofer. Connected: This auna digital radio features a Wi-Fi and LAN interface, which connects you to over 10k internet radio stations worldwide. The connected capability also allows you to control the player via your internet access. 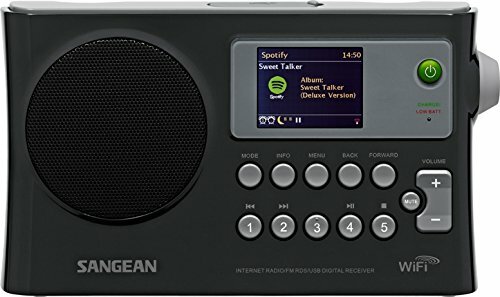 All-in-1: Just in case internet radio isn't enough the player has an analogue FM receiver. While a RDS function also provides you with useful additional content such as: artist, title, album, genre, and news. 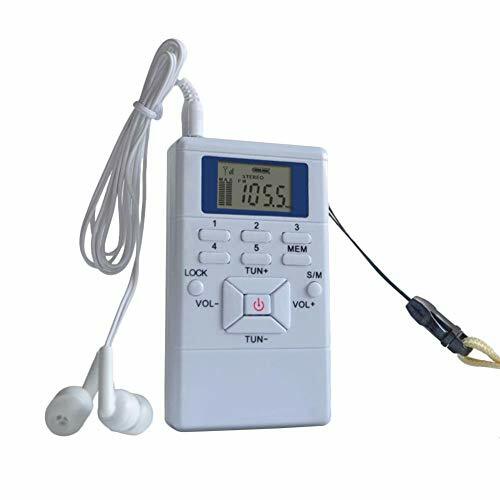 Adaptable: The Wi-Fi radio also provides an AUX input that can accomodate external sources such as mobile phones, MP3 players, and laptops while the MP3-capable USB port allows you to play any portable music files. Function: A 2.5 TFT display keeps you informed of the time, artist, or radio station while additional features include programmable wake-up functions, a dual alarm system, a snooze function, and a sleep timer. Very stylish but minimalistic, absolutely perfect for a modern room. An all-in-one, Wi-Fi internet radio,FM radio,connect to your PC or mobile via UPnP / DLNA, 2.4'' colorful screen. 8 Equaliser that can be tuned to different listening environment per individual liking. On the back of the device is a 3.5mm line out, an AUX in and 3.5mm stereo earphone output. There is a 5V USB port for charging external devices such as mobile..
- The Ocean Digital WR10 Hi-Fi tuner comes in a high-quality metal casing with Aluminum front. It gives you the ultimate audio experience and allows superb radio enjoyment. 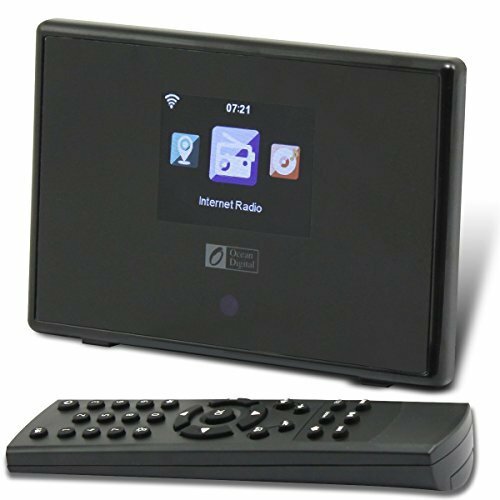 - Internet radio with DAB/DAB+/FM Receiver, network streaming or transmission of your own music to the radio via Bluetooth streaming. The Mondo+ (plus) from Grace digital provides superior sound in a stylish design that incorporates your favorite listening options into a single device. You can stream your favorite apps including Amazon music, Pandora, Google play, tune in, radio, Spotify, YouTube music and many others. Group multiple Mondo+ units together with Wi-Fi connectivity and control the stream content throughout your home. Max audio technology from Waves Inc. gives the Mondo+ room filling sound from the custom 3-inch woofer and 1-inch tweeter speaker drivers. Charge your phone through the USB 5V port in the back or plug in a compatible USB storage device with saved music files and play the music directly through the Mondo+. Bluetooth V4.1 integrated chip allows you to also connect and play music from your smartphone. 3.5-inch color display shows playlist; station and album art while streaming music and makes for easy navigation through menus, settings, and apps. Make your device portable with the optional rechargeable battery (sold separately). all product names and trademarks are the property of their respective owners (Bose, SONOS, demon, sound touch 10, play 1, HEOS Etc.) which are in no way associated or affiliated with Grace digital or the Mondo+. Product names are used solely for the purpose of identifying the specific products that were compared in the analysis. Use of these names does not imply any co-operation or endorsement.